"Fight Night - IKF In Gym Training Event""
Training Inspector: Robert Vincent, Gemma Mendoza & Jeff Zolot. 6-13-17: Gourgen Amirian has been suspended until IKF receives his AB2007 JUNIOR CERTIFICATE! CLICK HERE! Daniel Castillo was issued a 30 day no training and 45 day no competition Medical Suspension after accidental TKO until July 4, 2017 by Dr. Lenny Spivak M.D. Fighter was unable to continue. 6-13-17: Steve Rodarte has been suspended until IKF receives his AB2007 JUNIOR CERTIFICATE! CLICK HERE! Eugene Provencio was issued a 180 day no training and 180 day no competition Medical Suspension until December 8, 2017 after Injury by Dr. Lenny Spivak M.D. Fighter was unable to continue due to possible fracture of right tibia. Can be cleared by x-ray and medical doctors letter sent to IKF. Juan Carlos was issued a 180 day no training and 180 day no competition Medical Suspension until December 8, 2017 after Injury by Dr. Lenny Spivak M.D. Fighter was unable to continue due to injury of right knee. Can be cleared by x-ray and medical doctors letter sent to IKF. Damon Tavangar was issued a 30 day no training and 45 day no competition Medical Suspension until July 26, 2017 after KO by Dr. Lenny Spivak M.D. Fighter was hit by 1 hit to the jaw area, not a hard hit, just hit the right spot to cause the fighter to drop. The following fighters were not allowed to compete after a complete pre fight physical by Dr. Lenny Spivak. Fighter has been informed and advised by Dr. Lenny Spivak. of an abnormal EKG reading and concerns for follow up with his regular provider. Fighter was not allowed to compete due to skin issue in the torso area per Dr. Lenny Spivak. Harut Khachatryan Trainer Gourgen Amirian has not turned in his JUNIOR CERTIFICATE. Matthew Gonzalez Trainer Steve Rodarte has not turned in his JUNIOR CERTIFICATE. 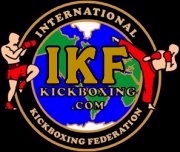 (**) IKF is asking if Jordan Rhines has ever fought as a PRO Muay Thai Fighter? (**) For the SECOND event, Rizzo failed to disclose his Amateur MMA record. (**) Charles Rizzo: DISCLOSE ALL PKB OR NOT BE ACCEPTED!